Rosette is a new bright red early season apple, named for the rosette-like pattern of marbled pink flesh that is revealed when you cut the apple open. 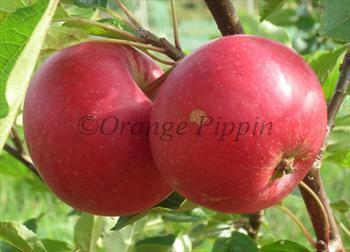 It is one of the best-flavoured pink-fleshed apples available, and is also easy to grow. Red or pink flesh is very unusual since most apples have white or cream flesh, and it will certainly make your Rosette apples a talking point. The flesh does not brown (oxidise) that quickly either so it can be used to add an interesting colour to savoury or fruit salads (although a dash of lemon juice will help). 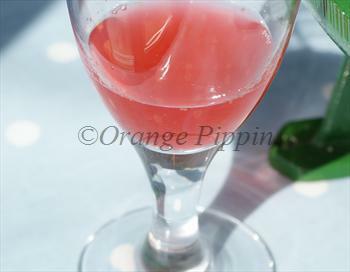 As you would expect, Rosette produces a particularly attractive pink apple juice - but the juice is not just a pretty colour, it is also of very good quality, with a pleasant sweet-sharp flavour. Rosette® is a protected variety. Please fill in the details below and we will let you know when Rosette apple trees are back in stock. One of the earliest English apples, ripening in early August. Rosette is in flowering group 2. Rosette is self-sterile and needs to be pollinated by another tree of a different variety nearby. Rosette is a good cropper, and notably compact. It appears to have very good natural disease-resistance to scab, and is therefore suitable for growing throughout the UK. (Scab tends to be more prevalent in areas with higher rainfall). We have noticed the pink flesh of this apple may become a deeper red in seasons when there are cooler night time temperatures during August. The depth of colour also seems to be linked to the sugar content of the apple - the sweetest apples have the reddest flesh. Whatever the explanation it is clear that to get the best appearance and flavour it is worth leaving the apples on the tree until they are fully ripe. To confuse matters further, like several early-season English apples, Rosette has a characteristic of dropping 5%-10% of its apples just before they are fully ripe - so don't let this fool you into thinking it is time to pick. Rosette was developed in the West Midlands and released in 2011. Almost all red-fleshed apples trace their ancestry back to a unique crab-apple called Niedzwetzkyana, discovered in central Asia in the 19th century. 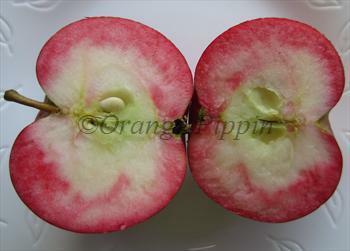 Since then growers have sought to retain the characteristic red-flesh, whilst breeding-out the unpleasant crab-apple flavour - but it is probably fair to say that no currently available red-fleshed apple with this ancestry has yet achieved the level of flavour associated with the best mainstream apple varieties. Niedzwetzkyana also has fairly poor disease resistance, and many of its descendants inherit its susceptibility to scab. The ancestry of Rosette is not known, but it is clear that apart from the pink flesh it has little in common with Niedzwetzkyana, and appears to be most closely related to the well-known English early apple, Discovery. Like Discovery it is an early-season variety, and also like Discovery it is easy to grow and largely disease-free.